Yttrium iron garnet spheres (YIG) serve as magnetically tunable filters and resonators for microwave frequencies and present high Q factors. YIG filters are often used as preselectors and integrated in spectrum analyzers. The resonance frequency of the filter, at fixed coil tuning circuit current, varies with the operating temperature. YIG filters best performance is achieved when its temperature is constant. These devices are usually provided with an internal heather system which help to stabilize the temperature and thus also their the response. However constant monitoring of the temperature is essential during warm up and operating phases to avoid spurious responses. A real-time temperature monitoring system has been designed and implemented using a thermistor PT100 placed on the YIG filter metal case, a PIC 16F876 microcontroller, and a serial LCD display. The temperature determines a variation of the R of the thermistor, which is fed with a constant current. Therefore a change in the temperature determines a change in the thermistor tension drop V. This is acquired via the 10-bit ADC of the microcontroller, converted into temperature value, and displayed on the LCD screen. The system detects temperature in the range 40°C to 60°C with a precision of 0.1°C. The 4 potentiometer on board allows changing the range. The core of the analog circuitry is a voltage controlled current generator independent of the load value, which is the thermistor in this case. The microcontroller provides limited operators (add and shift only), while the thermistor relationship R to T is nonlinear. Therefore the conversion from the V value acquired by the ADC to the YIG filter temperature is implemented with a lookup table. The PIC 16F876 assembler code is available here, including routines for the serial LCD control. 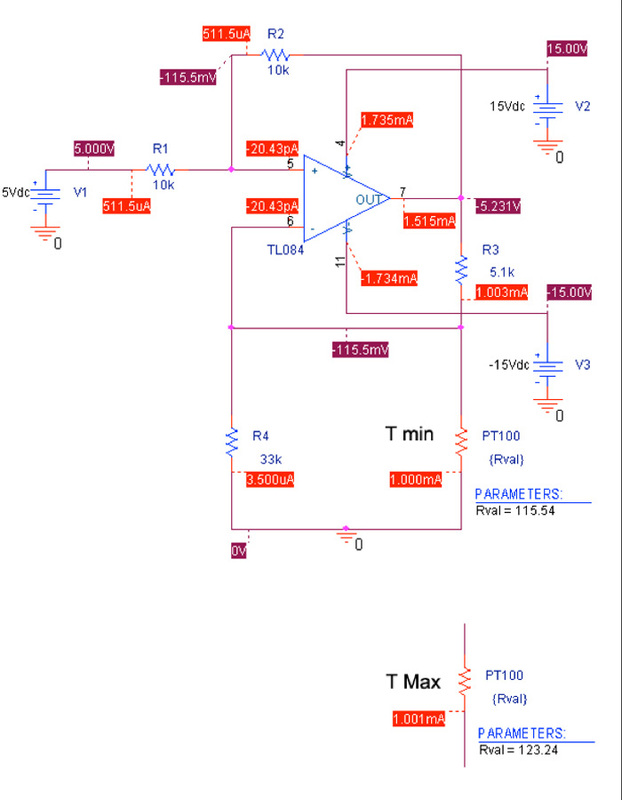 The figures below shows the schematic of the constant current generator, the schematics of the whole system, the PCB layout, and the manually assembled temperature control board. This work was developed in the framework of my B.Sc. Thesis in Electronic Engineering. S. Fasciani, “Design, Implementation and Test of a YIG Filter Temperature Control PCB,” B.Sc. Thesis, University of Rome Tor Vergata, Italy, 2003 [PDF in Italian]. Tagged firmware, microcontroller, microwave, pcb, sensor, temperature, thesis.